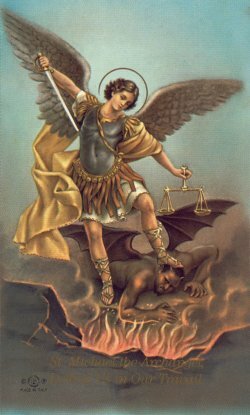 Today’s the feast of St. Michael & All Angels. Can I claim that as a name day? I never know which biblical James to claim as my name sake so I may as well celebrate on Michaelmas, too. Doug Blanchard posted a picture today of the new sculpture of St. Michael at the Vatican, which was blessed this past Summer. It is a provocative and beautiful angel. I am meditating on victory as I look at the pictures. I am also reminded of all the little Roman Catholic prayer cards I collected as a child. In the sculpture, Michael is in classic form, he holds the lance that will enter Satan’s throat as delicately as he might an oyster fork. His poise and balance evoke all the weightlessness one expects a winged being to possess. St. Michael’s chest is apparently essential to the more contemporary depictions of him, the chintziest of which show him with a sea-through gauze-like breast plate, so you can still glimpse all the details of his chiseled perfection. He’s not built, just toned. He is graceful, he is fair, his hair is soft and blowing in the wind, like the blonde-haired blue-eyed Jesus if he had spent time at the gym. He’s a fem-boy, which I want to celebrate even though I know that here its a held-over archetype of fair-skinned purity from the golden days of colonialism. Satan is shown with more grotesque, beastly strength, his monstrous size and ugliness are emphasized. He is also almost inevitably a person of color. In the end, these racially charged archetypal Anglo images of Michael’s victory are meant to depict a weightless, perfect grace which has come to dominate deformed and brutish strength. In addition to being triggers/remnants from colonial puritanism, I feel like these contemporary artistic renderings of Michael’s victory could also be icons for all fey and fem boys of the playground: the ones who could only dream of finally defeating their private bullies underfoot, the ones who grow up to be flawlessly dressed purveyors of high culture while their childhood tormentors languish with beer bellies and dead-end jobs. This ideal of fem-boy victory is, of course, as rosy and removed from the truth as a blonde-haired blue-eyed Jesus, but it still conveys something true worth hoping in: that real power is not in what looks powerful upon the earth. Not in intimidation, not in size, not in violence, not in force, but in kindness, gentleness, humility, service, generosity, and reconciliation among other things. Not like Michael is about to reconcile anything other than a final death-punch to his enemy. Perhaps, though, that blow is artistically undecided. Perhaps he will spare the strong man beneath him. It’s also not like our own victories are ever as clear as what these images suggest is about to happen. It’s not like the deformed insecurities within us ever fully cease to wield their brutish aggression in our lives. If anything, the mastery we seek merely domesticates the impulses we deem to be evil. In our human life we live suspended in the tension of what we learn is good and the primal obstacles we face in giving that goodness a principal role in our thoughts, choices, and actions. In ivory, bronze, and oil paint, St. Michael remains suspended in the seconds before the final blow when what is evil is eliminated. Ultimate victory remains to be seen, felt, and tasted, in his campaign and ours. God, you are the source of our strength, you lengthen our stride beneath us and you incline our hearts to seek your way of loving-kindness among the cruelties of this world; awaken your strength within us now, grant us victory over fear, and lighten our hearts with the serenity of knowing that your way conquers all evil in the end, through Jesus Christ our Lord. Amen.